PRICE: $40-45.00 to your door. Émile Dewoitine responded to the “Chasseur 1" specifications issued in 1930 by the French Air Ministry for a replacement of the Nieuport 62. Following the prototype’s first flight on June 18, 1932; 60 D.500s powered by the 690 h.p. Hispano-Suiza 12Xbrs engine were ordered in November 1933, with the first production airplane taking flight on November 29, 1934; the initial order was increased to a total of 101 D.500s delivered by late 1935. Following these D.500s armed with two 7.62mm machine guns mounted in the fuselage and synchronized to fire through the propeller, the D.501, powered by the Hispano-Suiza 12Xcrs engine and armed with a 20 mm cannon firing through the propeller hub with a single machine gun under each wing, was ordered; 157 were delivered by mid 1936. Both types entered service in July 1935. The next year, 120 D.510s with a more powerful 860 h.p. Hispano-Suiza 12Ycrs and armed similarly to the D.501 were ordered. 381 D.500/501 and 510 fighters were produced. They served with both the Armée de l'Air and the Aéronautique Navale. Unfortunately for France, the D.500 series was the first of the “Nouvelle Vague.” While the first flight of the D.500-01 was June 18, 1932, well ahead of any competitors, by the time it was formally introduced into service with the Armée de l'Air in July 1935, the prototypes of the Bf-109, the Hurricane, the Spitfire and the P-36 had all flown, each of which were significantly more advanced than the Dewoitine. Adoption of the airplane in significant numbers as it was at a point of revolutionary change in aircraft design meant that it actually delayed acquisition of truly modern fighters by France until it was virtually too late to meet the threat of World War II. The Morane 406 was not ordered until 1936, and did not replace the Dewoitines in first-line service until 1939. The D.520 prototype did not fly until after the outbreak of World War II. In 1937, China ordered 24 D.510s that saw action against the Japanese; the Dewoitine was close to an equal in terms of performance against the IJNAF’s A5M Claude, but the Japanese pilots were superior to their Chinese opponents. The Japanese knew all about the D.510, having ordered two for evaluation as the AXD. Lithuania took delivery of 14 D.501s in 1936; an additional 14 on order were diverted to Spain where they saw limited service in the Spanish Republican Air Force, along with twpo D.510s. At the start of World War II in September 1939, D.510s were still operated by three Groupes de Chasse (Fighter Groups), two Escadrilles Régionale de Chasse (Regional Fighter Squadrons in North Africa), and two Escadrilles de Aéronautique Navale (Naval Aviation Squadrons). One escadrille of D.510s (ERC571) was activated in Morocco as late as November 1939. In May 1940, the escadrille merged with ERC 573 to form GC III/4. This Groupe was disbanded by the end of August 1940. At Dakar, GC I/6 remained in service until being replaced by Curtiss H-75s at the end of 1941. France would have been better served if Émile Dewoitine had not been first, and had instead been able to follow the developments of others with the magnificent D.520 at around the same time the Bf-109, Hurricane and Spitfire entered service. Still, the D.500 series marks an important milestone in fighter aircraft development. 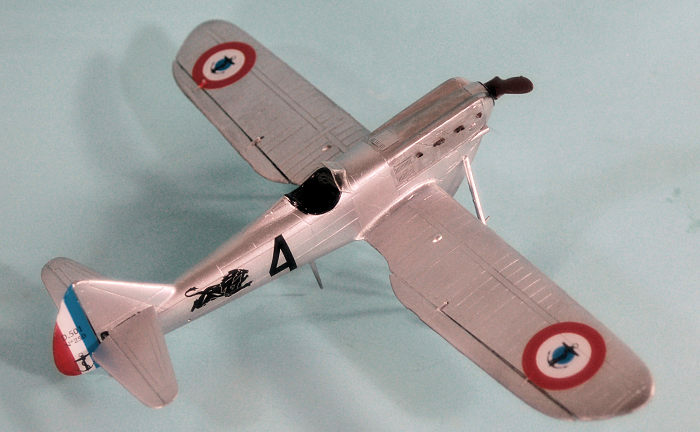 Both Hi-Tech and Fonderies Miniatures released 1/48 kits of the D.500 series some 15 years ago. They were as “builder friendly” as any other kit released by these companies. I can’t remember which one I got (I think Hi-Tech) but the last I remember of it was it was half-built in its box when it was stuffed in the “shelf-of-doom” box for the move four years ago. If I ever find it, I’ll keep the decals and toss the rest. In its previous existence as AMG, Dora Wings released the D.500 and D.501. The D.510 is the first release of the series under the new company name. In fact, all three sub-types can be built from any kit, as all the parts are there on the sprues. For anyone interested in this airplane, the Dora Wings kit is the kit to get. It resides in that space between “limited run” and “mainstream injection-molded,” i.e., a the kit has nicely-molded parts, but a modeler needs to treat it in assembly as a limited-run kit in order to get a first-rate result. This D.510 kit has decals for the two D.510s operated by the Spanish Republicans and the two demonstrators sold to Japan. There will undoubtedly be a second release with decals for D.510s of the Armée de l'Air and possibly a release of the airplane in Chinese service. First off, I decided I wanted to do a French airplane. The only decal options were from LF Decals, a Czech company that makes very interesting and unusual markings in their decal sheets. Since I was only able to find the second of their three sheets (one each for D.500, D.501 and D.510) for the D.501, I built the kit as a D.501 of the Aéronautique Navale Escadrille 3C3 flying from Marignane in 1937. Overall, the kit is easy to assemble if you take your time to clean up parts and test-fit during assembly before gluing. I only needed filler along the fuselage centerline, and the centerline of the cowling and radiator assembly. I started with the cockpit, painting it a dark blue and then assembling it. There is sufficient detail for most OOB, but super-detailers could have fun with this. While the fuselage was setting up, I assembled the wings and the engine cowling and radiator bath sub-assemblies. I needed to modify the fit of the ailerons to the wings, cleaning up the parts and widening the slots in the wings. The engine cowling fit easily, while the radiator bath needed to be pushed into position and held while the glue initially set up. I then assembled the wings and horizontal stabilizers and attached the rudder. Positioning the landing gear was a bit fiddly, and I had to sand down the wheels to get good fit inside their fairings. Once this was done I set things aside to fully set up overnight. I gave the model an overall thin coat of Tamiya Gloss Black for primer, then painted the model with Vallejo metallics. I used White Aluminum for the overall airframe, with Aluminum for the engine cowling and the radiator bath. I painted the wheels with Tamiya “Tire Rubber” and attached the clear resin windshield, then attached the prop. This kit is easy to assemble and the result, whichever version you do, will look good. The D.500 series are historically important airplanes. I’m pretty sure I will be doing a D.500 and D.510 in the future. Recommended for modelers with experience doing limited-run kits. Take your time and get a great result. Review kit courtesy of Dora Wings.